Strong demand and real estate fundamentals have continued to drive a development boom in the Greater Portland area. Interest from local, regional, and national tenants looking to expand and attract new talent has created a wave of projects across the city. The hospitality sector continues to lead the charge with office not far behind. Below we highlight some new projects and provide updates on others that were in the pipeline in Q4 2017 or Q1 2018. 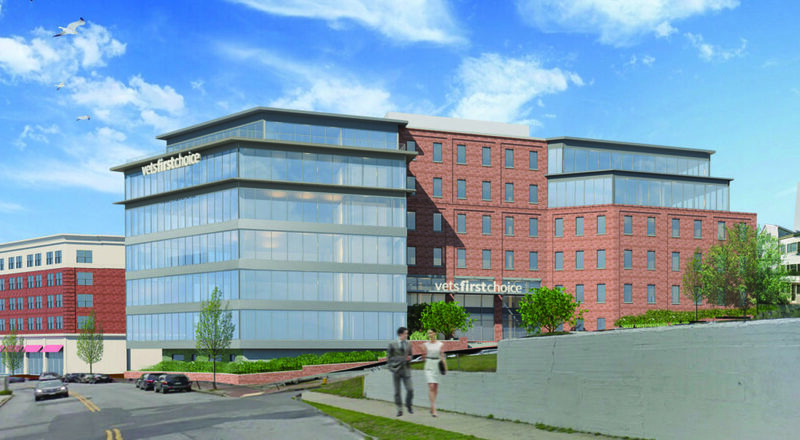 The largest office development announced in the past year with city approval is the new headquarters for Vets First Choice in Portland. The new facility, located at 12 Mountfort Street, is slated to be nearly 164,000 SF and house approximately 1,500 employees. In addition to office space, the property will feature a pharmacy, a fulfillment center, and multiple labs. The 100,000 SF WEX headquarters being built on the corner of Hancock and Thames Streets in Portland is nearing completion. The architecturally distinct design is a welcome addition to the Portland office market and the owners are in the process of negotiating deals for the first-floor retail space. WEX has additional expansion plans in the works that would occupy, at least a portion of, two more buildings in close proximity, with structured parking. The newest hotel in downtown Portland is the 150-room AC Marriott near the new WEX headquarters. This chic hotel offers ample natural light and a great bar overlooking the waterfront, for hotel patrons and downtown professionals looking for a change of scenery. Construction has begun on the Hobson’s Landing development located at the former Rufus Deering Lumber Co. site. The development will be built in phases, beginning with Aloft-branded hotel featuring 155 rooms. The second phase will include 200+ residential units with first-floor retail space. The Center Street Boutique Hotel, a 135-room high-end entry, is planned for the corner of Center and Commercial Streets in Portland. It will be six stories with a facade of glass and brick and a rooftop patio. Portland’s waterfront and city approval, a project for a 400-vehicle parking garage and Class A office space could begin on Central Wharf, Commercial Street. Hotels proposed at 58 Fore Street, 205 Commercial Street, and Thompson’s Point are all still in the planning and preconstruction phase. An industrial development located at 2401 Broadway in South Portland that will offer units of various sizes in three different buildings is in the works. The property will likely be split into as many as 19 units, ranging from 3,000–28,500 SF. In Saco, two new developments are available for purchase as small industrial condos. The new buildings, located at 10 Mill Brook Road and 24 Industrial Park Road, are offering units ranging from 1,500-3,000 SF. Formerly known as Dirigo Plaza, a new owner/developer has taken over the project located at the site of the former Pike Industries quarry on the Portland/ Westbrook line. This site is master-planned for a 1,000,000SF+ lifestyle center that will be built in phases. The first phase will be a mix of regional and national retailers anchored by Market Basket. Future phases will include Class A office, medical, event, and residential components. The completed project will be the first of its kind in Maine; creating a nexus where residents and employees will have home, work, and play at their fingertips. The Greater Portland area continues to attract new retailers, new office tenants, and new hospitality groups—the walkable urban environment is currently in high demand by employers, visitors, and residents alike. With large scale developments still in the works at Scarborough Downs, Thompson’s Point, and Portland Foreside, we’re optimistic that these trends will continue. By attracting new businesses and people to the Greater Portland region, developers can continue the strong, responsible growth that we’ve seen for the past decade. Copyright © The Boulos Company 2019 - All Rights Reserved.